Mercedes Ibarra discovered Flamenco in 1995 at UCLA when choosing a dance class on a whim. She had studied other forms of dance throughout her childhood and was looking for any dance class to squeeze into her college schedule. She fell in love with Flamenco during the very first class and her teacher, Liliana de Leon-Torsiello, described her as a natural and asked her to join her company, DeLiRitmo, within a year. After her years at UCLA, she became a member of the Gabriela Garza Flamenco Dance Company, performing at several venues in Los Angeles and Orange County, California. In 2005, she and her husband, Tarik, moved to Spain where she studied at the world-renowned Centro de Arte Flamenco y Danza Española, Amor de Dios, in Madrid. While she was there, she studied with Flamenco masters such as, La Truco, David Paniagua, Inmaculada Ortega, Marta Jimenez and Manuel Reyes Maya, the latter being her primary influence during that time. While in Madrid, Mercedes also performed at the tablao, El Juglar in the historic Flamenco district of Lavapiés. Mercedes and Tarik returned to Los Angeles in the Fall of 2008. Although a professional dancer and teacher herself, Mercedes believes that you should never stop training and continued her study with local masters, including Roberto Amaral and Linda "La Matadora" Andrade. In June of 2010, she studied with Manuel Liñan and the legendary Manuela Carrasco at the Festival Flamenco Internacional de Albuquerque, New Mexico. In addition to her solo work, Mercedes has collaborated with many other artists. She has performed as a featured dancer in the Briseyda Zarate Flamenco Dance Company. She collaborated with Collage Dance Theatre’s 25th anniversary performance, “Governing Bodies” at Los Angeles City Hall, in 2010 under the artistic direction of Heidi Duckler and joined Heidi Duckler Dance Theatre for a reprise of "Governing Bodies" at Ventura City Hall in 2015. She regularly works in partnership with Karina Velasco and her company, Cuatro Caminos Flamenco, as well with Claudia de la Cruz and her company. She continues to perform with Linda Andrade and is a featured dancer in her company Sakai Flamenco, which works in collaboration with the Los Angeles Music Center to bring Flamenco performances to Los Angeles area schools. Because of her various projects and collaborations, Mercedes Ibarra was nominated for and accepted into the International Dance Council at UNESCO in 2014. Finally, Mercedes has been the Flamenco teacher in the Ballet Folklorico Conservatory at the Orange County School of the Arts since 2016. Audience members and peers have described her as possessing deep musicality, elegant arms and detailed hand technique, aire, and an infectious joy for dancing. Mercedes is often introduced as a dancer that embodies the true intensity of Flamenco, primarily due to her expressiveness and powerful stage presence. She has been teaching at local dance studios since returning from Spain and is regularly invited to local schools as a master teacher and guest performer. 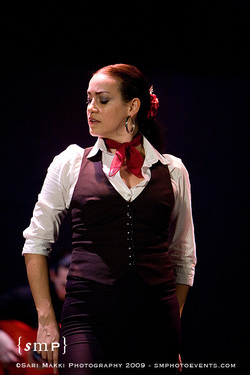 Mercedes can be seen performing regularly at various venues on the local Los Angeles and Southern California Flamenco circuits.